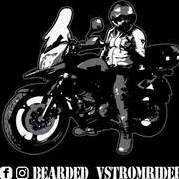 Bearded-vstromrider had the most liked content! 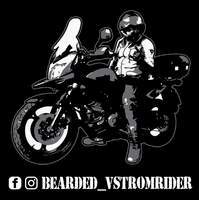 V-strom, adventure riding, motorcycle sports, camping. Sorry for the late reply.... @Stara__Varos Here's some pictures of the bike loaded. certainly a good upgrade to do... I changed my stock V-strom 650 pegs for the Touratech pegs. Quite a difference! CRE race track experience! Time, 05:15 h. My alarm clock rings and it’s time for me to get my breakfast in my stomach, take a shower and jump on my bike! The 1,5 hour drive to the TT race track in Assen took me to the TT junior track and the CRT Holland training ground for the CRE track training. Here I met with 37 fellow Suzuki riders. Greeting us where the men and women from Suzuki Motors Holland who set up this training day. Briefing Before we could start melting our tyres and scratching our footpegs on the asphalt. We needed to get a safety briefing. This CRE safety briefing included the meaning of the different flags that signal what you need to do on the track in case of any changes. Also they told us not to stop to help someone who crashes. This felt kind of unnatural to me but it made perfect sense. Better to have one person on the ground then a whole pile up on the track. After being set to the proper mindset, CRE gave us our rider number. 60 blue was my sign. They put us in 4 different groups coded by colour, for the training on the Junior Track. This part of the day was there to make us proficient in cornering. It also made us explore the capabilities of the bike. TT junior track The junior track is a way smaller but way more corner intense track than the actual TT track. The track consists of a South and North loop. These loops are riddled with corners and turns which will make you flinch at first glance. The CRE instructors take you round and around the South and North loops. Turning the flinching into smiling! In total you’ll ride 8 stretches of 10 minute rounds. CRE instruction proves it’s worth! Photo by: wegraceinfo.nl After about 5 minutes the CRE instructor gets off and you have to find your own perfect lines and curve entries. This really makes you think about the cornering, throttle and braking. And this makes you better! 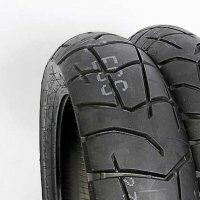 I personally went from 0.659 degrees decline to scratching my footpegs around the corners in about 2 rounds. So this means you still have 6 rounds of 10 minutes to train your new skills. The CRE instructor gives you personal feedback on your riding style and this makes for a good ride all day long! He told me, that if I wanted to keep some pegs to stand on, I should lean into the curve more with my body. He told me to sit on the side of my saddle. If I felt like Rossi or Marquez, I should even lean in more. But! Never exceed your comfort zone to much he said. The CRE instructor motto: “Push the envelope, but keep it fun and real”. The Big Track After nice lunch, we enter the afternoon CRE programme. This included a little bit of theory about the TT Assen Race Track, and another safety briefing. Directly after that we were sent down to pick up our transponders and let them get mounted on your bikes. These transponders send back your laptime but also monitor your Decibel output. Legally on the TT you are only allowed to ride with an exhaust that emits a maximum of 101Db. If you exceed this they will flag you with a black flag and end your trip with a heat-seeking missile. Before we could enter the track we needed to split up again in groups. At the Parc Fermé we arranged these groups and we were the first ones to ride! I followed my CRE instructor onto the track and started slamming my V-strom into the track curves. Photo by: wegraceinfo.nl But sadly, as good as my high seated, broad handlebar and manoeuvrable Strom handled on the Junior track. It wasn’t powerful enough to reach any real speed on the track. I thought this would get boring then… But man was I wrong. Fun all over! Finding the ideal line of entry, exiting curves full power and ramming through chicanes at 90 km/h. Awesome! Strubben At the TT race track I found my Nemesis. The curve called Strubben. The first few tries it bit me hard. I couldn’t get the right angle, speed and driveline to get through it. But with some coaching from the CRE instructor and my fellow riders, I was able to get it done! I can’t imagine how they do this with speed exceeding 100-200km….. Verdict: Satisfaction It was a very long and very intense day. My legs hurt, knees ached and my back is blown. But it was all so satisfying. I’ve learned to trust my bike that much more now and above all.. I trust myself more. I for one, am now a lot more confident on my bike. Both me and my Strom can do so much more than I thought. I can recommend a CRE or CRT training to anyone. No matter what bike you ride. You don’t have to be fast or take the corners the best. You just have to be the best you can be on your own bike. Video of V-strom on Race Track. Finally packed to head off to Switserland. 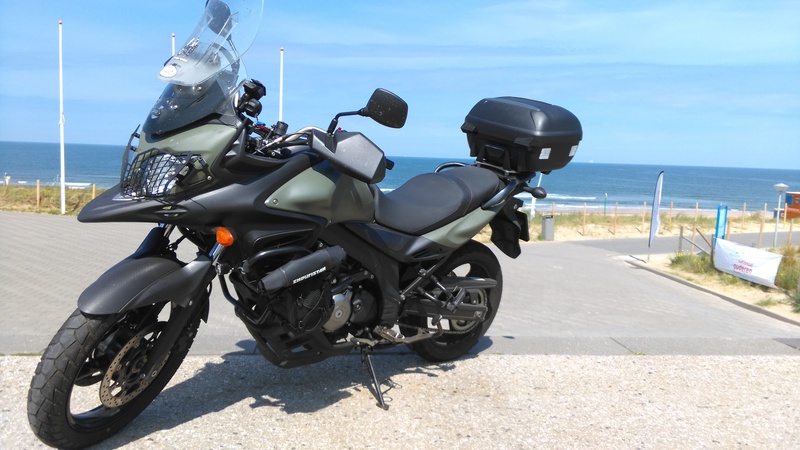 This Enduristan Blizzard L saddlebags, fitted with two Base Packs can really haul some gear! - 2 pers Tent - sleeping mat - Toiletries - hoodie sweater - extra coolwear for under my suit - 3 pairs of socks and 3 pairs of boxers - KLiM baseball cap - Emergency lighting - Petzl headlight - WakaWakaLight solar powerbank - set of batteries - normal powerbank - phone charger / GoPro charger - 2x Gopro, spare phone, TomTom rider In an addition to that i have two Enduristan Base Packs mounted to my crash bars. Containing: - Chainlube / cleaner - reflective vest - motorcycle specific tools - summer and all- season gloves - extra cables for brakes / throttle - rope, duct- tape, electrical tape - zip ties - 4x ROK Straps - The ultimate stretch strap What do you carry on a trip? Ahh. Never seen that spray! Do you have a link? Cool! Thanks for the feedback. Very nice pictures dude! Groeten uit Utrecht! What do you carry for 1-2 day rides? Back pack / saddle bag One set of (non-smelly, non-biker) clothing Spare knickers for the rest of the trip BIVI-bag incl. sleeping bag. set of camp shoes. Enduristan Basepacks (mounted on crashbars): Left: Med kit (bandages / Israeli bandage / mouth-to-mouth kit / painkillers / disinfectant / little bottle of whiskey foot pump WAKA WAKA powerbank (solar charge) Right: Some hand-tools and spare bolts and zip-ties Duct tape and electrical tape Chain cleaner / lube Fold-able shower bag ( Only when i'm planning on camping near water, heaven! ) In/on my jacket: Cell phone spare map Petzl light spare keys hydration pack.